A composite deck is a beautiful addition to your backyard. Compared to other types of wooden decks, composite decks stand out because it’s made from a combination of different types of wood fiber as well as binding agents and plastic. As a result, you get an incredibly elegant deck that you’d want to show off when you entertain. Composite decks have many advantages over wood; they certainly last longer and are low maintenance. But one major reason why homeowners choose composite decks over wood is because of its uniform shading. The boards are made using one batch of combined material which ensures that all boards look the same as the next. However, to keep your composite deck looking great and lasting you a long time, it needs sealing. Two elements it’s exposed to the most are water and sunlight, both of which are extremely damaging to wood over time. Composite wood decks are also prone to fading, mold, and mildew. Just because it’s low maintenance doesn’t mean that you should omit the maintenance part completely. Some homeowners think that sealing composite decks is optional although should you choose to wait until damage and mold occur, you’ll only be faced with a preventable and costly inconvenience. Meet the Defy Composite Deck Waterproofing Sealer. This innovative and environmentally-friendly sealer is made specifically to protect composite wood from damage caused by water and the sun’s harmful rays so that you won’t need to reseal it for another season or two. It also effectively fights off fungi, mold, and mildew. Defy Composite Deck Waterproofing Sealer comes in a crystal-clear finish containing zinc nano-particles that provide your deck with added protection by shielding it from ultraviolet rays, which are notorious for causing fading and color changes in deck wood. These nano-particles also strengthen its mildew-fighting formula because they act as natural deterrents to spore growth. Its unique zinc nano-particle technology is pretty much like sunscreen for your composite deck! Just like sunscreen prevents premature graying and discoloration in your skin, it does the same for composite wood. This is important because your composite wood is exposed to the sun’s rays all its life. The Defy Composite Deck Waterproofing Sealer’s water-based formula is much easier to work with compared to solvent-based. The latter tends to leave an amber color on the surface of composite wood. 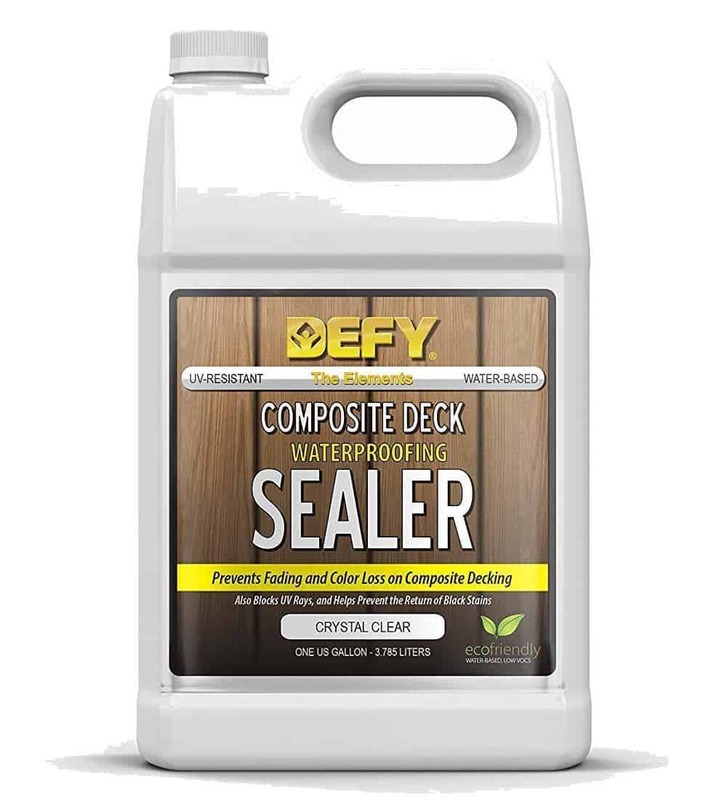 On the other hand, Defy Composite Deck Waterproofing Sealer’s water-based formula goes on clear and will not alter the color of your deck at all. Protect your composite deck from water, UV rays, graying, mold, and mildew. Defy Composite Deck Waterproofing Sealer is the sealer for the job. Applying Defy Composite Deck Waterproofing Sealer to your deck is simple and straightforward. All you need is your choice of one application tool: you can choose from a deck brush, hand brush, and paint roller. Before your first application, proper cleaning is critical. Make sure that you’ve already removed any stains, dirt, or mildew on the deck before application. A power washer does an effective job at cleaning and removing stains and other particles. Keep in mind that whatever you don’t remove while cleaning, you can no longer get out after sealing so you’ll want to invest time and effort during this step. Avoid using bleach at all costs during cleaning. This is a common mistake many homeowners make. Bleach may be effective in killing mildew spores but it won’t eliminate them from the surface. Bleach will also kill vegetation and plants around the deck. Choose an environmentally safe product that doesn’t harm plants but is also effective in removing spores. When you have to apply a maintenance coat, you no longer have to strip the surface but just make sure it’s clean. A single maintenance coat of Defy Composite Deck Waterproofing Sealer is enough. One gallon of Defy Composite Deck Waterproofing Sealer is enough for covering 100 up to 150 square feet of wood. If you are treating horizontal composite decks, just use a single coat and that’ll do the trick. When it comes to natural wood surfaces, use two coats of Defy Composite Deck Waterproofing Sealer then wait for around half an hour in between coat application. It should dry up within 2 to 6 hours. When we looked at what customers had to say about Defy Composite Deck Waterproofing Sealer, it’s clear that it’s the composite deck sealer of choice in the market. Customers say that its formula dries fast and leaves a terrific-looking deck. Some of them prefer the slight sheen that it imparts on composite wood because other composite deck sealers out there don’t have the same effect. It’s also a bit pricier than others, although customers say that it’s worth the price. And although the Defy Composite Deck Waterproofing Sealer was meant to be reapplied after 1 or 2 seasons, homeowners have found that this can vary depending on the exposure or the weather because it lasts for up to six years for some. On the other hand, a few homeowners found that the Defy Composite Deck Waterproofing Sealer had no impact on their composite deck. A few also discovered stains after some rainfall. It’s important to take note that correct application of Defy Composite Deck Waterproofing Sealer is critical to getting the most out of this product. This sealer won’t work if you just slather it on, so make sure to read up on proper application. Want to see the difference Defy Composite Deck Waterproofing Sealer will make on your deck? Check out websites that sell this sealer at a great deal such as Amazon. It’s just a few clicks away, and the Defy Composite Deck Waterproofing Sealer will be on your doorstep in a matter of days. Composite decks have serious advantages for homeowners as opposed to wood. When you choose to go with composite decks, it requires some care and maintenance from your end so that it will last you a long time while looking great. But that can only be achieved with the use of the right sealer. Look no further; Defy Composite Deck Waterproofing Sealer is the only one you’ll need.